The first thing a service company like ours does is, of course, rent office space for the team to work from. An office is nice, but every once in a while the feeling hits each of us—the burning desire to stay at home, or sink in the comfort of that cozy Starbucks armchair for a change (yes, we’ve all worked there). You know, the urge to be anywhere but not in the same place again. So… we gave it a shot! We have introduced a company-wide remote work day. From now on everyone in Naturaily can work one day a week from… wherever they want. While our curated list of top remote work spots in town is growing strong (we hope to share it with you pretty soon), we would like to present five reasons why we have decided on remote work day and what benefits such a solution brings. 1. Remote work fosters loyalty! These “words of wisdom” should be kept in mind not only by those in love, but also by employers. Developers are a professional group prone to change jobs frequently. Companies creating software for their clients are outdoing themselves in new forms of entertainment and perks to encourage developers to stay and pursue their professional careers with the company. But constant presence in the office always implies some control, and can thwart your most elaborate ways to please employees. It is easy to forget that people have a life beyond ​their desks. So maybe, instead of a forced lunch break and a pool table in the entertainment room, why don’t you show your workers some trust and love, and give them the freedom to choose where they want to work, helping them to reconcile the job with their private life. Such an approach is much more likely to yield benefits in the form of employee commitment and loyalty. It’s a perfect way to show people you really understand their needs, and pays off better than offering people “mandatory entertainment”. 2. Free yourself from the Groundhog Day… and wake up your brain! The diversity and ability to change the environment is an excellent way to stimulate the brain! Any deviations from the regular daily routine contribute to formation of new connections between neurons and improve brain activity. The brain is an organ whose daily activity consumes substantial amounts of energy. This, naturally, encourages our body to economize and organize activity into cycles of repetitive actions. While patterns and habits certainly make our lives easier, their excess make your brain lazy, and may contribute to developing depression. A day out of the office is a perfect way to break out of the everyday “beaten path” and stimulate the brain. Developers are people who do very creative and intellectually challenging work, which is why they need changes and new stimuli to support their thought processes and help them find solutions to problems. But all in all, what they’re really after is some peace and quiet… We all seem to forget that for some folks teamwork and constant contact with other colleagues does not necessarily help solve problems, and might even double the effort and time required to finish tasks. Of course, we do acknowledge the noble ethos of helping each other and the value of sharing experience with colleagues. While these things are important, there are numerous challenges people cope with better when left alone. On top of that, finding oneself in the hustle and bustle of the office with all the “distractors” this situation entails may dangerously raise levels of cortisol (hormone stress), and hamper effective work. So… let people sit in silence, it just pays! This will definitely have a positive impact on their attitude to work… and life. It’s no secret that maintaining right work-life balance is important and that a worker who has time for additional passions can more effectively perform their professional duties. It’s a win-win situation at its purest. Employees gain a few spare hours, and you get happier employees in return. Of course, we do recognize the value of direct contact with people and teams. We also know how valuable such contact is—even the most trivial chit-chat in the snack room has some merit. 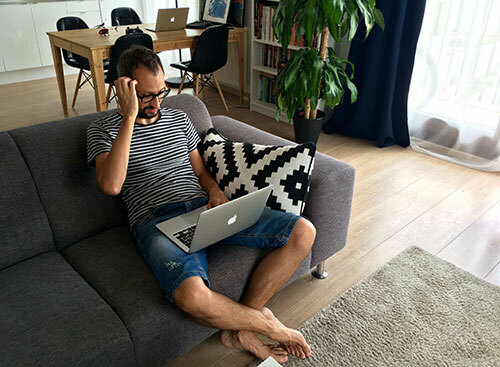 And even though not every position is equally fit for the “Remote development team” setting, remote work is still worth considering. We’re making our first steps in implementing remote work and are open to reading about your experiences. Is allowing telecommuting a good idea? If not, what are the consequences?